Best car dealership I have ever dealt with! They did everything they could to get me my beautiful Ford Fusion! Chris and the rest of this team are awesome! To the service department. Mark got us in, diagnosed the problem with my wife's Jeep the same day, ordered the replacement part and took care of our 2 recalls and back to us the next business day. Excellent service! We just had the best experience buying a car here! Loved that Nick and Michael were so knowledgeable and went above and beyond to make sure we felt comfortable with our purchase. Would def recommend your dealership to our friends ans family! Great customer service! I came in told them everything we wanted and what our price out the door was. They worked to make it happen. Awesome experience. The salespeople were great and listened to our wants and needs and found exactly what I was looking for. Financing Agent was awesome and did everything he could to get us the best deal possible. Great experience. 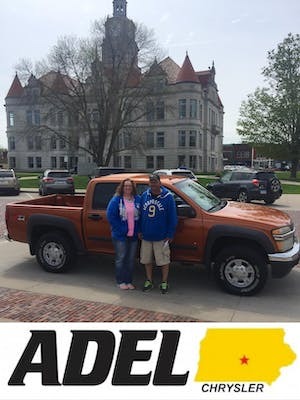 I was so happy with my experience at Adel Chrysler Dodge Ram!! Justin Winfred helped us find the perfect vehicle and all the staff was so hopeful and friendly. Thank you everybody for all your help!! A great service staff that make sure repairs are done right! Sales team is friendly and not afraid to work for you. Great repair service. Always trustworthy and timely! This was my first NEW vehicle! The staff was so considerate in helping me find, and drive off with, the vehicle of my dreams!! From the second I walked in the door I was treated with respect and importance...I didn't feel like just another sale. I will continue to shop with this staff, they support my future endeavors! After shopping around and dealing with several other dealerships buying a vehicle from from here what's the best decision I've made, the staff is great willing to do what it takes to make a sell. It was nice to have a sales and finance manager who come out and introduce themselves before you even start negotiating on prices. Our experience at Adel Chrysler was the best. We had an outstanding salesman, great finance guy and the whole team has helped us through it all! They are fair on trade ins and care about the relationship! We love our Jeep! Just bought a newer Jeep! Everything went so smooth and they were great at helping us with our upgrade!! We will definitely be back! Thanks for the great experience!! Just bought a 2011 Silverado from Travis and Shane! Awesome guys to work with and will do their best to see you find YOUR perfect car! Really enjoyed working with Michael, Ross and Carla throughout the entire process. It was the most relaxed and enjoyable car buying experience I've ever had. I highly recommend the dealership to anybody interested in being treated like an individual instead of a number. Best experience buying a car!!!! Thank you for being so helpful!!!! Terrific team! Ross and Katelyn answered all my questions. Friendly atmosphere and a family feel... the way every dealership should be. I would recommend them to anyone looking for a good deal and great service!!! The short drive from Des Moines is definitely worth it! they went above all expectations i have found a place where all my car purchases will be made. They worked around my schedule and fixed the car quickly. They called me before doing anything that I hadn't originally asked for. Throughout they were kind and exceedingly polite. Would not hesitate to bring my car back if necessary. Very helpful staff, tended to all of my needs! Chris, Shane, Ross, and Rhonda are the dream team of car sales! Rhonda Marx is the BEST!!! I am loving my new Jeep! She made my new vehicle purchase smooth & easy. She went above & beyond. I will never purchase from anyone but Rhonda & Adel Chrysler. This is my second purchase with her, 100% Satisfied and Customer for LIFE! We have been buying from Jim doll for 40+yrs. Know we will start with the new owners. They really care about the customer. Chris did a fantastic job finding me affordable financing. The service was fantastic. Love my new car! Customer friendly and knowledgeable team ready to help with your trade in and next auto purchase! Make sure to meet Rhonda for straightforward financing options! Rhonda Marx has made auto sales a full time career for many years. You cannot substitute dedication and industry knowledge when making a major purchase. Rely on someone who knows and cares, rely on Rhonda!! Rhonda Marx is one of the easiest people to deal with when buying a vehicle. I have known her for several years now and highly recommend purchasing from her! Yesterday I went in with the intention of purchasing a cheap winter car. I dealt personally with Mike Doll. I can honestly say, in 15 years of working with car dealerships for various reasons, it was the most comfortable I have ever been in a dealership. Within two hours, my trade was processed, my credit approved, and I was driving home in my 2012 SX4 that I got for a steal. Mike made me feel like a friend and not just another customer. 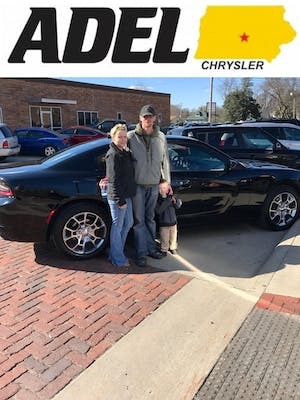 I was very happy with my experience purchasing a new vehicle from Adel Chrysler. I was greeted and helped by a friendly, no pressure staff. Mike listened to what I was looking for and was able to help me find exactly the car I was looking for. I was more confrontable with this staff than the bigger dealerships. Thank you for the positive experience. Worth the 4 hours drive! I had the opportunity to work with Chris at this dealership. His costumer service was outstanding. Being four hours away from this dealership I had several questions and concerns. Chris was able to explain several things in detail (purchasing, features on the car, policy of getting title, buying out of state, etc) and set my mind at ease. He never pushed me to make a decision and was understanding of my schedule regarding when I could come to the dealership. When I arrived he had the car ready for test drive and was welcoming. There was no hidden fee's, surprises, etc. The car is in perfect working order and this buyer has no complaints. I feel fortunate I was able to work with Chris and would highly recommend this dealership to anyone. Thank you very much! My wife and I have bought many cars in the last 25 years and we have had some bad experiences with car dealers. I can tell you that Mike and John are the best people that we have dealt with buying a car. We had a no haggle great price and were allowed to test drive the car without them with us, If you are buying a car you should at least stop and see them. The small town experience is worth it if you want to escape the big dealers pressuring you.